The 1 bedroom Apartment "Andalhue" (a cosy place under the sun in the chilean indian language "Mapuche") in Marbella, El Rosario, beachside, is completely furnished and is situated about 800 m from the beach "Alicate Playa". It has a big community pool. 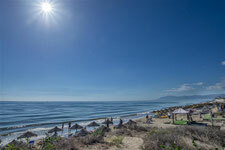 To Marbella there are approximately 4-5 kilometres. Just nearby you have shopping possibilities, bars & restaurants, tennis clubs, several golf courses, a big hospital, various pharmacies, bakeries and many diferente sportive activities to enjoy and to relax. Babysitter, cleaning services and much more available upon request! Nachfolgend unser Belegungsplaner für Apartment Andalhue. WIR EMPFEHLEN IHNEN EINE REISERÜCKTRITTSKOSTENVERSICHERUNG & ein Auto vor Ort! We recommend a travel cancellation expenses insurance and a car on location.